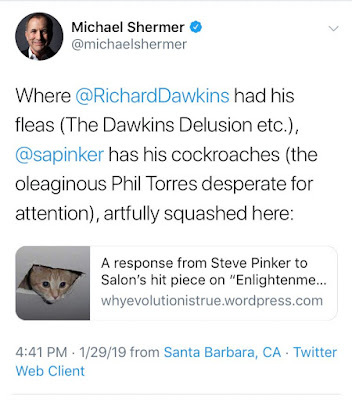 To witness the shamelessness and intellectual laziness of the Intellectual Dark Web/Quillette gang, you only need to review Jerry Coyne's publication of Steven Pinker's response to Phil Torres' Salon article. 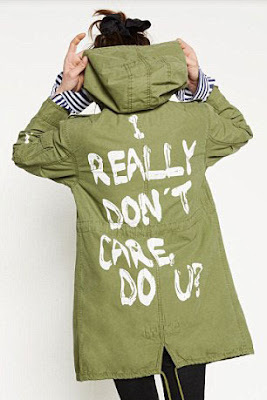 IDW people are never the subject of critiques but rather, always, the poor beleaguered victims of "hit pieces" from those with illegitimate motivations. Torres’s piece, I conclude, is not an act of judicious and scholarly criticism, but an anti-Pinker hit job motivated by things other than a concern for factual accuracy. Both Coyne and Pinker demonstrate what I have begun to think of as the rhetorical trademark of the Intellectual Dark Web: when you are confronted with an argument you can't refute: ignore it or dismiss it. They went with dismissal in this case. When I read Torres’s piece, I wasn’t impressed, as Pinker’s “errors and false assertions” seemed to consist mainly of quotations used in EN that, claimed Torres, don’t accurately represent the actual views of the quoters (Torres contacted some of them). Coyne prefaces an admission that Torres caught Pinker misrepresenting others' views ("Torres contacted some of them") by saying "I wasn't impressed." The rest of Torres’s complaint consists of showing that some of the quotations I weave into the text come from people who don’t agree with me. OK, but so what? Even though I've recognized for many years that Steven Pinker is a weasel, I was astounded. "so what?" I was going to write my own response but found this piece by Olle Häggström via Phil Torres' Twitter feed. I admit I was relieved to find it. Pinker's dismissal of Torres' valid point was so shameless I wondered if I misunderstood somehow. 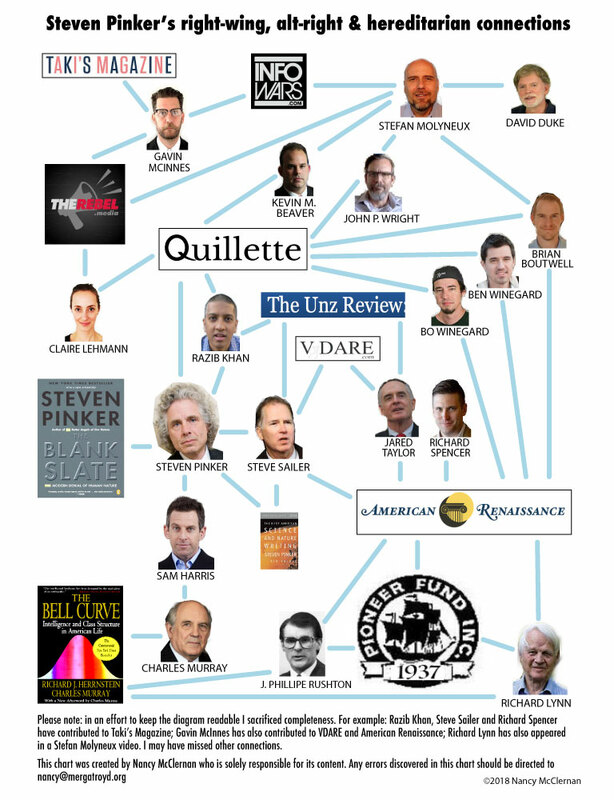 But no, Pinker really is that brazen. ...Pinker has now written a response to Phil's essay, and had it published on Jerry Coyne's blog Why Evolution is True. The response is feeble. Let me expand a little bit on that. After a highly undignified opening paragraph with an uncharitable and unfounded speculation about Phil's motives for writing the essay, 1 Pinker goes on throughout most of his response to explain, regarding all of the quotes that he exhibits in his book Enlightenment Now and that Phil points out are taken out of context and misrepresent the various authors' intentions, that... well, that it doesn't matter that they are misrepresentations, because what he (Pinker) needed was words to illustrate his ideas, and for that it doesn't matter what the original authors meant. He suggests that "Torres misunderstands the nature of quotation". So why, then, doesn't Pinker use his own words (he is, after all, one of the most eloquent science writers of our time)? Why does he take this cumbersome detour via other authors? If he doesn't actually care what these authors mean, then the only reason I can see for including all these quotes and citations is that Pinker wants to convey to his readers the misleading impression that he is familiar with the existential risk literature and that this literature gives support to his views. It seems that although the IDW likes to promote the idea that its critics are all "postmodernists" Steven Pinker is the biggest postmodernist of all - words can mean whatever he says they mean. 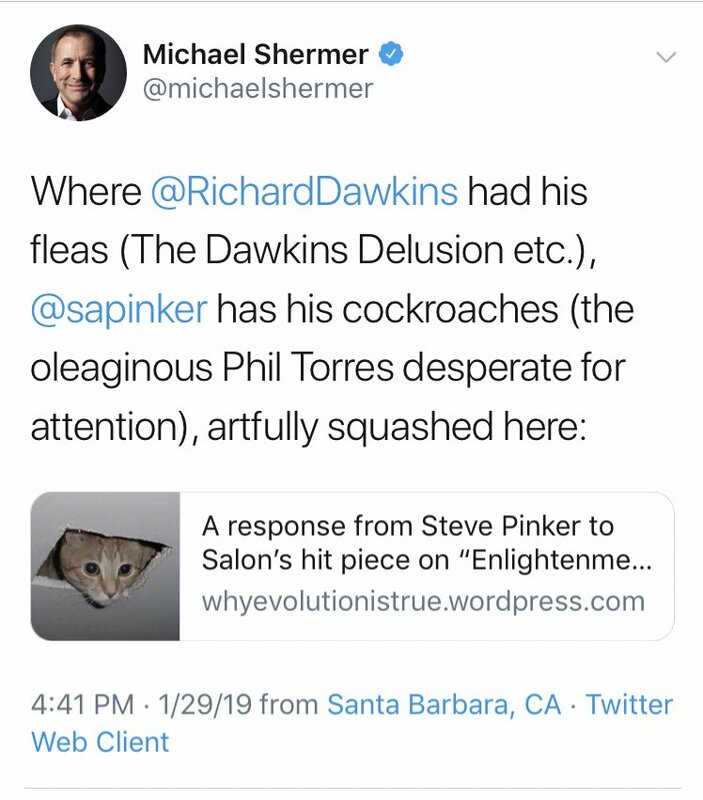 IDW regular Michael Shermer celebrates Pinker squashing the cockroach Torres. Which of course didn't happen unless you live on Bizarro World with the rest of the IDW gang, where words mean whatever Steven Pinker says they mean and misrepresentation is quickly dismissed with a brazen "so what?"